Home » Blog » Animal care » Storing pet food in bulk? We’ve got a plastic container for you! Effy modelling one of our 10l red plastic buckets! We’re always amazed by some of the novel uses that some of our customers come up with for our containers. Recently we’ve found out that several of our customers are using our plastic containers to store their pet food securely, safe from water and air. It’s important that you store your pet food in a proper container to ensure that you don’t attract flies, rats and other pests into your home. Also, pet food that is stored in its proper container will stay fresher for longer and reduces waste. Buying pet food in bulk can actually result in substantial savings too. If you’ve got the space then it makes sense to buy in bulk and store it in one of our larger containers. Whether you’re feeding a budgie or a horse, we’ve got a container that will suit your needs. 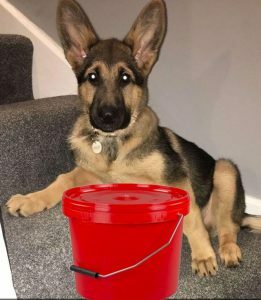 If you’ve got a small dog and need a dog food container that holds a smaller amount of food then our 5l plastic buckets with lids are what you’re looking for. They’re available in a range of colours. Slightly bigger dog? Our 10 litre buckets will probably be a better fit. If you’ve got a particularly large dog or a horse and you’re wanting to store a large amount of dog food securely, you’ll want one of our 25 litre products. Although we don’t advertise dog food storage containers on our website, you’ll find that most of our products can (and are!) used for a variety of purposes. If you’re unsure if a particular product is suitable for your purpose then give us a call or drop us an E-Mail and we’ll be pleased to advise.